"Up to this part of the slope our ascent had been fairly easy. We have now reached a spot where one long climb will take us to the level summit, and we shall behold that which has never been observed since the beginning of the world. " "From the side of the plateau on which we were, slopes of woodland, with occasional glades, stretched down for 5 or 6 miles to the central lake. I could see at my very feet the glade of the iguanodons, and farther off was...the swamp of the pterodactyls...I could see a number of dark holes...which I conjectured to be the mouths of the caves." Mount Roraima or Roraima Tepui was made famous in 1912 when Sir Arthur Conan-Doyle wrote his fictional novel entitled The Lost World. It describes the ascent of a Roraima-like mountain by an exploratory party in search of prehistoric plants and dinosaurs that were believed to live isolated and unchanged for millions of years on the mountain's summit. Conan-Doyle was inspired by the British botanist Everard Im Thurn who on December 18, 1884, with Harry Perkins, was the first to reach the summit of Mount Roraima. Im Thurn, whose skills included considerable expertise in botany, collected specimens from the Roraima area, from which scientists at Kew Gardens identified fifty-three new species and three new genera. Im Thurn and Perkins were not the first Europeans to see Mount Roraima. That goes to Robert Schomburgk, a German-born explorer and scientist who explored the region for Britain's Royal Geographical Society in 1838, and before him Walter Raleigh described a mountain of crystal on his expedition up the Orinoco to find Lake Manoa and El Dorado. 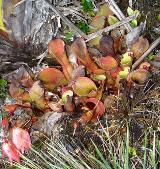 But despite the expedition's major contribution to botanical science, and Im Thurn's own accounts of his journey, published variously by the Royal Geographical Society, the Royal Scottish Geographical Society and Im Thurn's own Guyanan scientific journal, Timehri, these were eclipsed by the work of fiction with which Mount Roraima became associated: Sir Arthur Conan Doyle's imperial adventure novel, The Lost World (1912). 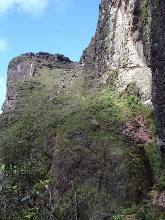 Im Thurn climbed Mount Roraima from the southeast by what is now called the Im Thurn route, the only easy way to the summit. His expedition had to fight its way through hundreds of miles of wild rivers and jungles. 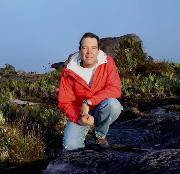 It was these stories of prehistoric plants and dinosaurs, bizarre labyrinths, adventure, and a chance to go back in time that moved me to hike into Mount Roraima New Year's Eve 2007. Waterlilies in the Tek River Climbing Roraima was truly an adventure. We spent our first day crossing the Gran Sabana from the Pemon village of Paraytepui, enjoying its landscape, and crossing the Tek and Kukenan Rivers. The second day we left a camp next to the Kukenan River and headed to base camp where we spent our second night in front of the massive Roraima walls. The next day brought us into and through tropical rain forests, sheer cliffs affording spectacular views, and up the massive walls on a rocky trail. When we reached the top, it was almost like walking on the moon. Strange formations of black igneous rock, believed to be over 1.8 million years old and eroded into all manner of strange shapes, dotted the landscape. Growing among the rocks were strange plants. Cascades of water formed pools and Jacuzzis which sparkled in the landscape. Finally we reached the "Guacharo Hotel", a group of shallow caves along the eroded rock suitable for pitching our tents for the next two days. 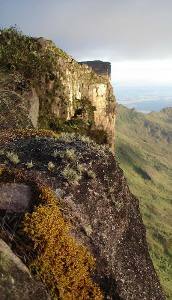 Atop Roraima, weather changes rapidly as clouds move over causing one minute to be grey and dark , and the next bright and sunny; then the scenery fades behind a curtain of light rain. We spent two days in this lost world, exploring its flora, fauna, and places like the Crystal Valleys, where thousands of quartz crystals cover the ground. We bathed in the Jacuzzis, small deep pools among the rocks with water temperatures of 40 F (4.5 C). We also made a day hike to "Triple Point" that marks the point where the borders of Venezuela, Brazil and Guyana meet. We also climbed to the "car", a rock formation that looks like a Ford Maverick, and it is the highest point on Roraima, offering a unique, spectacular, breathtaking view of the Gran Sabana. Finally on our way down we stopped at "La Ventana" (window) showing us a different landscape, looking to the west and into the Guyanan Amazon rain forest. It took us two days to hike back to Paraytepui. Unfortunately, there were no dinosaurs at the top of Roraima Tepui, but it was an unforgettable adventure in a lost world to begin 2007!